The Crescent Beach section of North Myrtle Beach is home to the upscale, high-rise condominium complex of North Shore Villas. These comfortable, nicely appointed three and four-bedroom, three-bathroom condos are located along South Ocean Boulevard, in the heart of North Myrtle Beach. A prime, oceanfront location makes North Shore Villas the ideal spot to catch a stunning view of the magnificent white sand beaches of North Myrtle Beach. Read more about North Shore Villas real estate. The amenities and services offered at North Shore Villas are perfect for a comfortable, relaxed and indulgent oceanfront living. 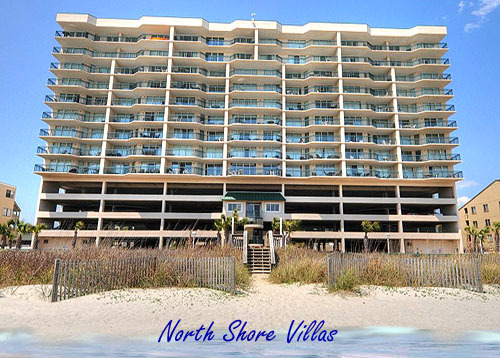 Perhaps the best indicator of the quality and luxury found at North Shore Villas is that in the nine years since it was constructed, North Shore Villas has had one of the highest repeat guest ratio of any other Myrtle Beach condo resort. The upscale features of North Shore Villas make it fit in nicely with the high-end accommodations along South Ocean Boulevard. Local sites and attractions are just steps from North Shore Villas, including championship golf courses, restaurants, shopping centers, amusement parks, music theaters, and water parks.